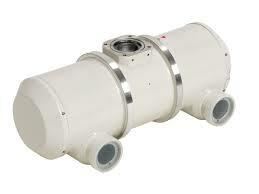 Rotating anode X-ray tube assembly for the purpose of general diagnostic X-ray procedures. These tubes have foci 1.5 and 0.6, and are available for a maximum tube voltage 125 kV. 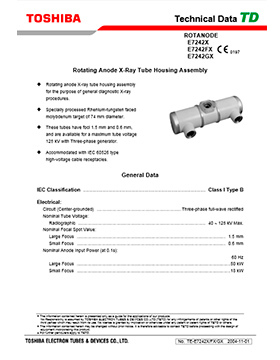 Accommodated with IEC60526 type high-voltage cable receptacles. Applied voltage between common and main terminal. The every applied voltage must be never exceeded 110% of the above specification. The speed-up time is allowed up to 110% of the above specification.